Whether you’re a car enthusiast or have many drivers in your family, three-car or larger sized garage plans have gained popularity in recent years. If you have a larger household, need additional storage space, have a boat or all-terrain vehicle, having that additional garage bay creates the extra space needed to house all of the vehicles and gadgets your family needs and enjoys. 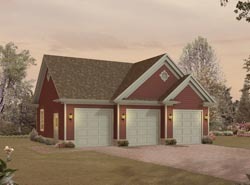 Our collection of three-car garage plans allows you to discover a garage design that will be seamless with the look and feel of your house design. 1136 Sq. Ft., Width 37'-0", Depth 35'-6"
1745 Sq. Ft., Width 40'-0", Depth 28'-0"
1036 Sq. Ft., Width 36'-0", Depth 30'-0"
2500 Sq. Ft., Width 50'-0", Depth 50'-0"
1207 Sq. Ft., Width 51'-8", Depth 42'-4"
House Plans and More's collection of project plans includes 3-car garage plans or larger in many different styles and sizes perfect for all of your needs. We offer detailed blueprints so a buyer can easily picture the finished result. With a wide variety of three-car plans to choose from, we are sure that you will find the perfect garage to fit your needs and lifestyle demands.